What happened after Art School? Shortly after Christmas Nita began her war service. She became a member of the British Red Cross Society and trained as a nurse with Detachment No.28 Glasgow starting on January 10th 1944.3 Her nursing duties were carried out at Stonehouse, Larbert and Mearnskirk Hospitals. This choice of service was the best suited to Nita's personality, quiet, reserved and practical, which enabled her to carry out caring and domestic duties which she had undertaken at home to help her family. She resided in hospital staff accommodation since all these hospitals were too far to travel daily and was paid £2 a week, around half the salary of those who lived at home. Dropped in at the deep end on her first night she was exposed to a rude awakening. Suddenly she was startled by the skittering of hoards of mice across her counterpane. Terrified she held her bedclothes tightly around her neck for the reminder of the night till morning. During daytime not all went smoothly either. As she developed her nursing skills occasionally she fell prey to the wrath of the matron. Uneasy when matron approached her anxiety resulted in more than a few mishaps. The crashing sound of trays of crockery dropping on the tiled floor is a lasting memory but perhaps the most enduring and embarrassing was the abandoning of a patient on his bedpan for an hour. The poor chap was only discovered when all the curtains were opened to reveal a very upper class outraged officer. On account of her good looks, her tall stature, blond hair and refined manner she had been chosen to attend the officer's ward. Subsequently she was given a severe dressing down and summarily demoted to the less genteel ward of infantry soldiers where her sensitivities were frequently injured. In her defence the whole affair, entirely unintended on Nita's part, was the result of long hours of overwork and under staffing which was typical of many workplaces during the war. The long hospital corridors were freezing cold with only two small paraffin heaters in the winter. Understandably she was most unimpressed by the uncouth behaviour of the soldiers. In Stonehouse Hospital she remembers clearly part of their routine before going out for some relaxation was to go down to the basement store and polish their shoes on the sheets due for laundering. The following weeks and months evolved into three years and like most young people at the time she alleviated boredom by visiting friends and returning home on leave to her parents and new young nephew Tom whom she adored. Her nursing service eventually came to an end in March 1947. It was now time to move on. With little time for painting during this period she was ready to start again. By now it was the first days of spring 1947, winter was over and having completed her war service Nita was desperate to get back to painting. She met up with former students, one of whom, Alexander M. Young, encouraged her to apply for a scholarship at Hospitalfield House. Alex had attended Hospitalfield and studied under James Cowie in 1946. While studying at art school Alex had been called up three weeks before completing his diploma in 1941, however W.O Hutchison the school director applied for a short extension allowing him to complete his course. Alex had been a prisoner of war in Japan and returned to art school to study for a postgraduate diploma in 1947. 5 He gained a prestigious prize, 'The Haldane Travelling Scholarship' in 1948. 6 Following Alex's recommendations Nita applied to the Head of Drawing and Painting, Hugh Adam Crawford, and after being sanctioned by the new Director Douglas Percy Bliss, was put forward and accepted to attend Hospitalfield House in April 1947. The house itself is one of the most stunning country houses in Scotland, in the gothic style, with features from the arts and crafts movement. Its origins lie in the 1200's when it was founded as a hospice by the monks from Arbroath Abbey. Patrick Allan acquired the estate through marriage to the daughter of the Fraser family, Elizabeth Fraser. The son of a wealthy weaver merchant from Arbroath, he studied art in Edinburgh, Rome and Paris. During his lifetime he was greatly involved with the art world and promoted international exchange as President of the British Academy of Art in Rome. He was a patron and champion of Scottish artists and in 1874 was elected an HRSA. As his own architect and with his artistic drive and commercial experience he substantially developed the buildings. Using mainly local skilled craftsmen along with his estate sandstone quarry, he added a large wing and converted a large barn into a gallery. Having such a keen interest in arts, crafts and architecture in the mid 1850's he aimed to create a stimulating environment for young artists which motivated him to collect many Victorian sculptures, paintings, and wood-carvings of international importance. On his death in 1890 he left it in trust as a residential art school for young men without financial means who wished to become professional artists, artisans and architects. The trust known as the 'Patrick Allan-Fraser of Hospitalfield Trust' would pay all their requirements for food, board and clothing. Hospitalfield House was from then known as the 'Patrick Allan-Fraser School of Art'. By the mid 1930's due to lack of funds Hospitalfield became a postgraduate school serving the four Scottish art schools in Aberdeen, Dundee, Edinburgh and Glasgow. As world war two began the future of the school was again in doubt since some art schools were not able to offer postgraduate diplomas and also young male students were being called up. To allow Hospitalfield to continue women and those with no previous art school training were accepted into the fold. For excellent photographs of Hospitalfield House see 'The Courier'. It was into this environment that three young graduates of Glasgow School of Art travelled from Glasgow in April 1947 arriving by train in Arbroath and walking the last mile of their journey. Waiting for them was James Cowie and his second wife Alice. In 1937 James Cowie RSA took up the position of Warden and art master with Alice as housekeeper, matron and general manager. James Cowie had spent many years as a teacher beginning in his youth; a pupil teacher from the age of 14 to 19, then completing teacher training, taught for 3 years at Fraserburgh Academy from 1909, leaving to study at GSA (1912), finally took up a position offered to him before his war service, as art master at Bellshill Academy in 1918. There he taught for 17 years until 1935 and left to take up the post, head of Drawing and Painting at Gray's School of Art in Aberdeen, where he only stayed a year. By the time Nita arrived at Hospitalfield house in 1947 he had been teaching for 30 years. Individually or in pairs they set up their drawing boards or easels against the view and set to work. Nita's shyness returned with a vengeance not allowing her to take full advantage of the opportunities presented. She remained indoors, studio-bound, not being able to contemplate the notion of anyone watching her attempt to form something worthwhile. The idea of Mr. Cowie peering into her work was inhibiting, and peering he did; sometimes into drawings by his own daughter Barbara, known as Barrie to the students, 'and saw all sorts of wonderful things', according to Nita. The others, Joan and Margaret sometimes in the company of Mr and Mrs. Cowie in the good weather would venture to the beach or fields. Nita still remembers a lonely wait among the trees for their return. Mr. Cowie by this time was thought of as an old man by the young students, in fact he was only 61 years. Alexander Robbie remembers him as 'easy going - a tremendous smoker'. Cowie regularly walked the short path down to the beach with him in the morning to visit a kiosk to replace his cigarettes. 12 Kiosks were set up to cater for visitors as during the summer Arbroath became a busy holiday town for people from the cities. James Cowie was very well educated and indeed a complex character. He was interested in literature and poetry from a young age with access to books both at school and home. He began an Honours Degree in English Literature studying for three years at Aberdeen University simultaneously studying to become an art teacher at the United Free Church Training College. Drawn in to art he gave up English Literature to complete his teaching diploma and graduated with a distinction in drawing. Teaching art for two years at Fraserburgh Academy did not satisfy his appetite for his own artistic calling so in 1912 he applied to Francis Newberry to study at Glasgow School of Art. He studied under Greiffenhagen and eventually in 1918 married a fellow art student Nancy Buchanan. It is thought that he may have studied at the Academie Julian in Paris for a short while. Teaming up with Robert Sivell and Archibald McGlashan together they formed the Glasgow Society of Painters and Sculptors. In line with his strong beliefs he was a conscientious objector who joined the Pioneer Corps and in 1918 after he was demobbed he took up his post at Bellshill Academy. Sadly in 1924, after six years of marriage, his beloved Nancy died from tuberculosis leaving him alone with a ten month old baby, Ruth. This tragedy was to affect him for the rest of his life but he did achieve some stability by marrying Alice and having a second daughter Barbara in 1930. Alice had been a teacher before she married and Nita believes she was also an artist's model. She too was clever. She was gregarious and socially ambitious and wished to mix in certain circles. Thought to be dowdy and old fashioned by Nita to whom she felt somewhat sympathetic. Alice always wore the same style of clothing to RSA meetings, a skirt with tunic and frills down the centre. Mr. Cowie would not be quick to furnish her with fine clothes and in reality there was only utility clothing for sale. When occasionally parcels arrived for the students, often little boxes containing three tubes of paint ordered from the usual suppliers, most likely Aitken Dott, Edinburgh. Mrs. Cowie found it hard to hide her curiosity. Her temporary residents came from such a wide array of backgrounds and - who came from which social class? - was a question which seemed to intrigue her. She did find things out and wisely made use of William and Angus. William had served an apprenticeship as a painter and decorator in Paisley from the age of 14 years while saving to support himself through art school. Whilst Angus had served as a joiner's apprentice in Arbroath on returning from war. Thus she employed them to clear out the hayloft and stables for use as stores. They also carried out a few odd jobs like decorating and repairs and indeed were well-qualified for the tasks. Of course they were paid and put their earnings to good use ordering their little boxes of paints. Everyone was strapped for cash. William shared his earnings with Nita which were useful for luxuries like cigarettes. Almost everyone smoked in these days, from glamorous film stars to parents and every type of role model. Barbara, Alice and James' daughter, was usually about the house or grounds as it was school holidays throughout July and August. 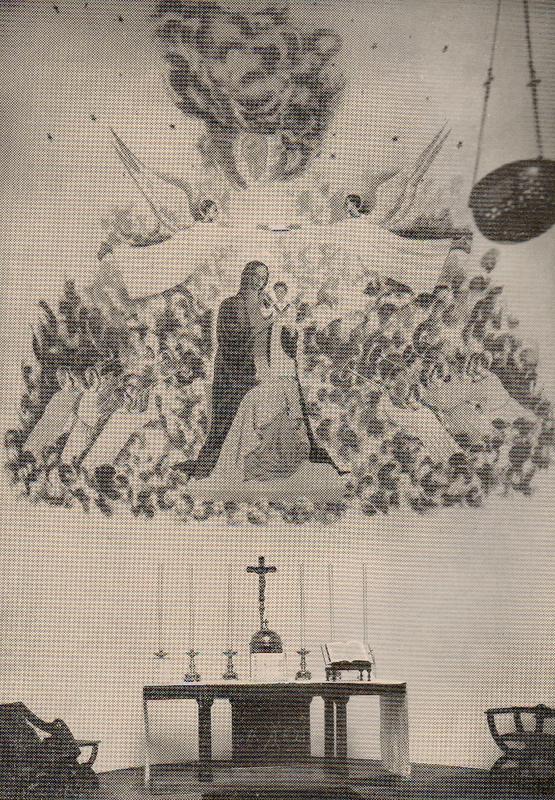 She was also encouraged to draw and paint. Mrs. Cowie raved about her. Nita thought her well-built but physically attractive with a beautiful mouth, eyes and good skin. Ruth would also be there for the summer months and away to study or teach the rest of the year. Another two members completed the family, Mrs. Cowie's cat Nollie, who occasionally strolled out of the food pantry when the door was opened and Mr Cowie's little companion, a terrier called Jock, who was partial to ice cream and attempted to jump up on any passing ice cream consumer. One of the students' duties was to walk Jock. Curiosity was not reserved to Nollie the cat but overtook the minds of Nita and one other who remains unidentified. One evening while Mr and Mrs. Cowie were out Nita and friend went in search of their bedroom, whether their curiosity was satisfied is not known but the urge to explore was fulfilled. James Cowie has been described as one of the most interesting and talented painters to have lived and worked in Scotland this century. He set the highest of standards for his own painting and that of his students. As would be expected with a strongly individual artist and successful teacher he had strong opinions and was happy to convey them. His personality has been described by some as, severe, astringent, domineering, rigorous, and critical. Like many Scots of his era he had been born into a strict Protestant farming family and expected to take over the farm, Netherton of Delgaty, Aberdeenshire. James was one of three siblings and had to be strong to escape the pressure of his farming inheritance. When his elder brother decided to follow in the footsteps of his uncles who had emmigrated to New Zealand to settle in new territory, James was left next in line. He had lived here during his formative days, his youth and early manhood but determined to follow his academic and creative ambitions, James remained resolved and firmly in the land of art. In 1919 his father died and the farm was soon given up. The farm, however, remained deep in his psyche. Painting after painting refers to the landscape of his childhood which was farmed for generations by his antecedents. In later years he returned many times with his own family to his Uncle's farm, the nearby Mill of Haremoss, absorbing the atmosphere from the land he loved and new best. 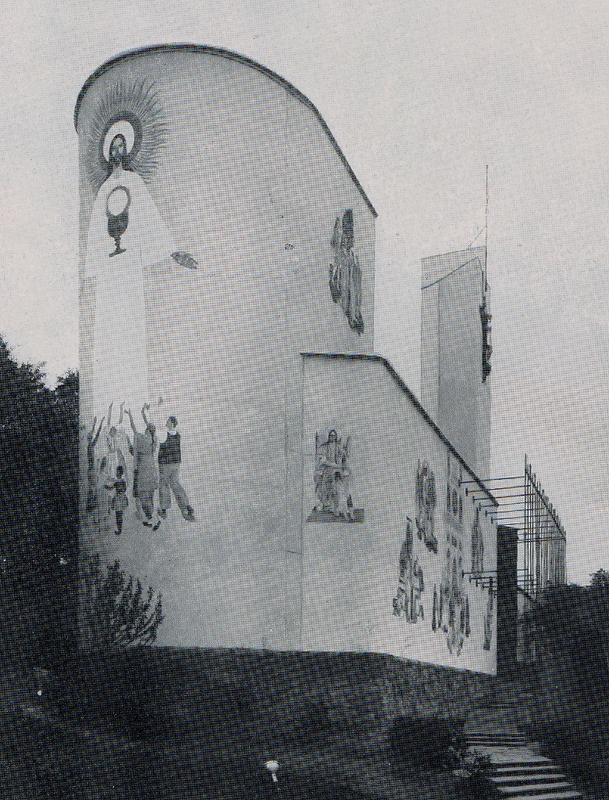 Hospitalfield followed his time teaching at Gray's School of Art in Aberdeen in 1936. After only a year he resigned when he found the restrictions of institutional life and other staff therein stifling his creativity. Hospitalfield was probably his dream post, giving him the artistic freedom and the luxury of sole influence on the students with no one to antagonize him. His earliest paintings of his wife, baby and young girls are more loosely but delicately painted showing great competence and pleasure in capturing an accurate portrayal in a more relaxed style. For early works completed in the 1920's see: 'Two Girls' (1920), oil; 'Girl Reading', oil; 'Girl in a Spotted Dress', watercolour; 'Girl in a Landscape'; 'Portrait of the Artists First Wife' (1919), oil; 'In the Classroom' (1922), oil; 'Self-Portrait with the Artist's First Wife', (1923) oil; 'Summer Day' (1925) oil; 'Sumer is icumen in' (1925-6), oil. After this time however almost all his work is in a meticulously measured style. In 1928 the striking portrait of the artist’s second wife Alice, 'The Yellow Glove', painted early in their marriage, shows the linearity of Cowie’s realist style yet still embraces a more painterly style in Alice’s clothing and yellow glove. His art-teaching career had begun in earnest at Bellshill Academy in 1918. Cowie used his classroom as his studio along with his pupils and thus was enabled to study, draw and them. 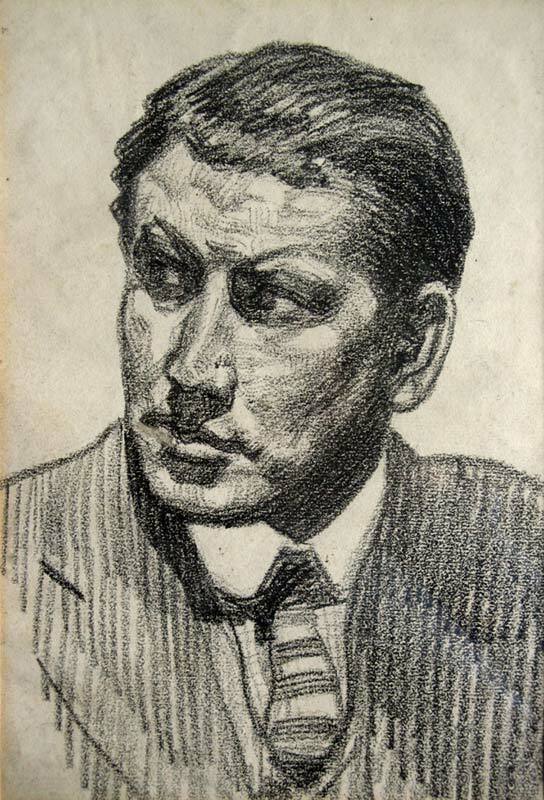 He had very strong views on drawing and painting with no time for those promoting Scottish Expressionist traditions. He worked in the style of the Old Masters of the Early Renaissance and often used examples of their work as a reference point producing detailed pencil studies of drapery, clothing and limbs. Oil painting then followed using his closely observed drawing studies and watercolours. He endeavoured to give his own paintings an Early Renaissance finish using the techniques like scumbling and glazing to produce a high quality of finish with a light tone, sometimes almost colourless. Every painting was painstakingly thought out, strongly linear and precisely constructed and often returned to and reworked years later. Finally he would work with oil and canvas creating a painting which he sometimes worked on for many months or occasionally over years. This of course would fit in well with time restrictions of working in class with short time periods of time with each class. Sketching and long months observing the young pupils resulted in long term painting projects. This method of working produced large number of small pencil and watercolour studies with a much smaller number of large oil paintings. His final composition could then be constructed by joining up these individual studies, e.g. see 'Two Girls' 1934. Most likely due to his love of poetry and literature Cowie also had a high regard for the Pre-Raphaelites who were influenced by literature for subject matter and also believed in restrained classical values of sincerity and simplicity of early Italian art. Members included John Everett Millais and Dante Gabriel Rossetti. Pre-Raphaelite influence is obvious in Cowie's 'Book and Leaves' (c1935) where he shows reverence to Millais' painting 'Autumn Leaves'. Also, in Cowie's schoolgirl portraits such as 'Falling Leaves' (1934), is a similar yearning to that observed in Rossetti's 'Mariana' which he must have viewed in Aberdeen Art Gallery and Museum (aagm); this yearning likely a deep consciousness of the passing of time probably brought on through many years spent teaching the younger generation. Most teachers experience a deeply felt sense of the own ageing as their charges remain the same age year after year while they themselves grow old. In Cowie's painting the autumn leaves seen falling outside the schoolroom window are thought to symbolise a passage from childhood to adulthood with an accompanying loss of innocence. He painted few landscapes but those which he completed demonstrated his ability as a talented landscape painter for example 'Castle of Auchry' 1944 which represents the landscape of his childhood. In the mid 1920's James Cowie discovered the work of Paul Nash (also see 'Autumn Crocus' 1928 oil, in Richard Calvocoressi’s biography, 'James Cowie', page 60). Inspired by the Surrealist features in Nash's art, Cowie began to experiment with spatial ambiguities in his own work. It was noted in much earlier times, before the First World War, while at Glasgow School of Art by Benno Shotz that Cowie 'was the first surrealist though we didn't know what to call it at the time'. During his time at Hospitalfield Cowie continued his experimentation with metaphysical expression. His still-life’s were composed using objects from a simple fresh apple to sheets of glass and items which he valued such as books, postcards, shells and small figurines or Tanagra. 'Still Life at Window' is characteristic of Cowie's style. The Tanagra figurines along with other still life objects positioned in front of a window create a surreal effect. The classical statuettes marry the classical world to the landscape of Cowie's youth. In ‘High Noon’, 1940 this small watercolour still life again uses a landscape as a backdrop with familiar objects set in a complex spatial relationship. Thus he created a collection of paintings which developed into surrealist dreamlike creations. Surrealist influences from Paul Nash can also be seen in 'Evening Star' 1940 which is considered to be one of Cowie’s most ambitious paintings. Working on this large-scale painting over the years 1937 to 1944 he used the curiously designed Hospitalfield easel frames as surreal motifs to experiment with space. They acted as both window and picture frame, a technique used by the Old Masters and well- illustrated by Pintoricchio’s ‘Ulysses and Penelope’ . Thou bring'st the child, too, to the mother's breast. Don Juan, a poem spanning hundreds of verses, relates to the contemporary world of Byron on social, political, literary and ideological levels. And indeed one of Cowie's selected literary figures was fellow native of Aberdeenshire son of Catherine Gordon, George Byron Gordon, becoming at age 10, Lord Byron. Byron received his early education at Aberdeen Grammar School and Cowie, who studied English literature at Aberdeen University, must have been fascinated by this adventurer, intellectual, and creative but controversial individual Anyone spending long periods reading Byron may be susceptible to being overtaken by melancholy especially a character of artistic and pensive nature and this appears to have been Cowie at least some of the time. Indeed the environment within and surrounding the Gothic Victorian mock castle of Hospitalfield, with its antique furnishing and classical objects with an extensive library of classic tomes, would create in one such as Cowie a mood of otherworldliness. Each year here was split in two, long optimistic summer days with spirited and lively young students sharply contrasting with six months of short darks days alone with Alice, when he would lose himself in reading, writing and working on his painting projects. More placid seemed his eye, and smooth his pallid front. Published seventy years before Cowie’s birth (1812-18) the poem, in a broad sense, is an expression of the melancholy and disillusionment felt by a generation weary of the wars of the post-Revolutionary and Napoleonic era; Cowie had been a conscientious objector and had lived through two world wars and would empathise with such expressions. He believed that it was not enough just for art to create an impression of reality but that a painting should convey an idea or express a concept. Cowie, in 1935 when asked, what is the function of a painting? wrote ‘The expression of an idea which has the power of provoking emotion. What moves in nature may be made to move in some way when nature is copied. This at the present stage of art history (we are suffering from a surfeit of impressionism or the lyrical) is to me not enough for a picture, which must be an idea, a concept built of much that in its total combination it would never be possible to see and to copy’. This intellectual approach of restraint, classicism and emphasis on drawing set himself apart from those with showy painterly styles and from many of his contemporaries. Creates an effect of Cubism by constructing a collage style-painting by using sheets of glass, postcards of classical paintings layered with other objects. The end product is of dreamlike images merged and knitted together helped by the small statues to give a Surrealist impression. Here we see the satyr used in its full glory. 'Noon' 1946 (see aagm) stands on its own as Cowie’s only painting with direct sexual potency. The male figure in this composition was based on a little model of a satyr that Cowie modelled from clay. The satyr seems to float beside the girl while the back view of the satyr is reflected in a mirror, as if in a dream-bubble suspended above the sleeping girl. An atmosphere of dry arid mid-day heat is created using colours of the desert with no green life to be seen. 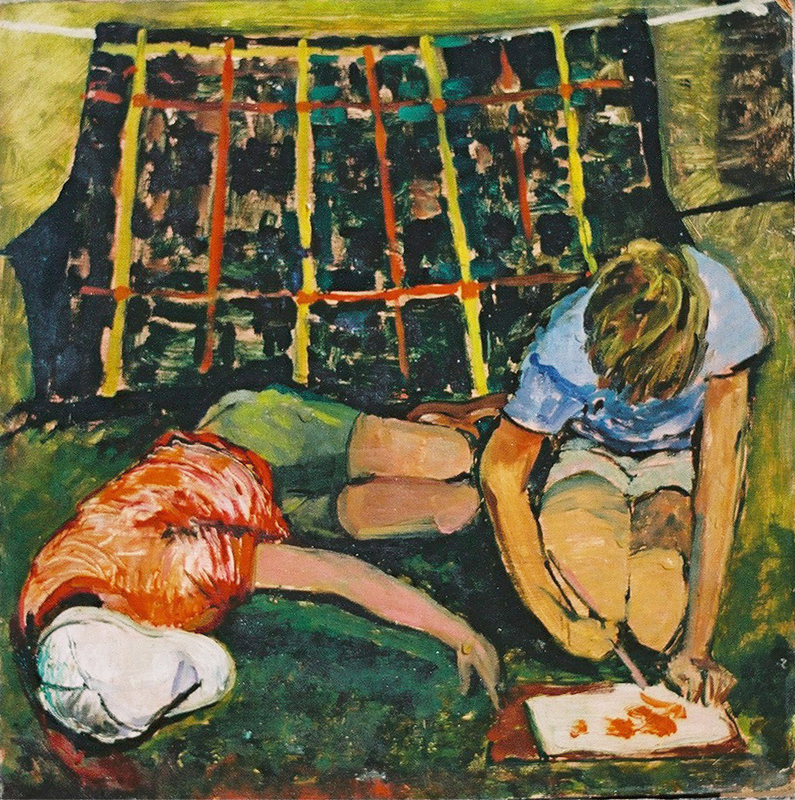 The girl is thought to be Barbara copied from an almost identical sketch and also seen in 'Outdoor School of Painting' (1938-41). Cowie’s influence on his students. By 1947 Cowie was a well-established artist, an RSA, and a very experienced teacher whom had already produced his most accomplished paintings. It is worth remembering this was an era when relationships between the generations were more formal, young people were not to get ideas above their station and any waywardness would not be entertained for a minute. Teachers in general had some social standing and authority; they should not be challenged. Born in 1886, Cowie was Victorian in essence and Scots Presbyterian by upbringing. Despite all this Nita found him a pleasant man and not at all threatening; perhaps he was sensitive to her shyness and lack of confidence. Her memory of this time spent at Hospitalfield was the challenge of being pulled in polar opposite directions on the style and form of art she had been taught. Hugh Crawford and the Glasgow School of Art Drawing and Painting department placed a very strong emphasis on high colour and free expression whereas here Cowie demanded tight drawing; line and tone with subdued colour with every mark being carefully thought through and planned. The evidence shows that for Cowie art was not meant to be easy, it was a personal struggle with reasoning and thought battling against instinct and romanticism; not for showing off but for making sense of the environment and human existence. Like many artists and deep thinkers he could not suffer fools and was quick to criticise but at the same time he recognised hard work, dedication, intelligence and talent in others. In the years 1937 to 1948 at Hospitalfield he taught and influenced many students. Among students of Cowie were; Marie de Banzie, Nita Begg, Robert Henderson Blyth, Isabel Brodie, William Burns , Waistel Cooper, Robert Colquhoun, Joan Eardley, William Gallacher, M.Inglis, Ray Howard-Jones, John Laurie, William Littlejohn, David Lockhart, Robert MacBryde, John Miller, Peter Murray, Angus Neil, Cordelia Oliver, Alexander Robbie, Neil Russell, Inga Svarc, Margaret Walker, Alexander Young: not all were residential. Although Alexander Robbie was a day-visiting student in 1947 and did not get to know the others at this time he attended Hospitalfield informally over a few years. A strong memory is of Bet Low (GSA 1942-45) as pretty as a picture in her red shoes in the summer of 1946. Alexander was born in 1917 and so by 1939, at the start of the war, had already graduated from the GSA. He was called up to the army from the outset. At the end of the war he was stationed in Germany and found himself called upon to teach art at Gottingen University. Thus, Alexander's teaching career began in a foreign land at the age of 28. His students were the same young men who had been called up to the forces from British art colleges like the GSA unable to graduate since their courses had been cut short. Alexander returned home to Arbroath in order to stay with his parents during the summer and undertook a teacher training diploma course during term time in the late 40's. He returned to Hospitalfield informally in 1948 and was guided by Ian Fleming (RSA RSW RWA RGI) the successive warden. Early on Alexander exhibited his work in the RSA and RGI in order to establish a high standard for himself. Jimmy Barr (GSA student 1929-35) a fellow student and later modelling lecturer (1938-39 and 1945-65), had become a great friend of Alexander's during their art school days. Barr retired in 1965 and died in 1969. Peers of Alexander also remembered are Willie Burns RSA RSW RI who was killed in a flying accident in 1972 and Johnnie Miller RSA PRSW (GSA student 1936-41) who taught at the art school. Alexander became a successful art teacher who taught for 19 years in Calder Street Secondary School, Blantyre, then transferred to St. Ninians R.C. School, Kirkintilloch for the remainder of his career. In Blantyre he developed the art department by introducing weaving and crafts. His father had been a textile engineer and had a good knowledge of weaving. Alexander set up eighteen looms in classrooms with the help of a local carpet manufacturer who supplied wool and employed some of his school leavers. It was a great success. Pupils were invited to the factory to view the processes involved in weaving carpets and were treated to ice cream and afternoon tea. He also enabled young students who sought out his expertise to achieve a portfolio of a standard to submit to art school. This private tuition he carried out on a voluntary unpaid basis. Alexander was also an experienced skier and became the first ski instructor in Scotland. A lover of yachting he sailed around the West Coast of Scotland, once travelling as far as Norway and was the proud owner of four yachts over 40 years. After his wife passed away in the late 1970's Alexander gave up sailing and travelled with friends to the four corners of the world. Alexander died 30 July 2014, aged 96. Cowie was already well aware of William Gallacher; there were always connections between students of different decades and generations. Cowie was a former student at the GSA himself and among his fellow students were Archibald McGlashan and Benno Schotz. William had been a student of Benno Schotz and later became a fellow lecturer; at some point he was commissioned to paint and decorate Benno Schotz’s Glasgow apartment. While Archibald McGlashan was a friend of William’s father, John Gallagher, a serious amateur painter whom occasionally exhibited his work, (two of his oil paintings are held by Paisley Art Gallery and Museum). Both had lived in Paisley. And since William also was familiar with some of Cowie’s earlier Hospitalfield students such as Robert Colquhoun and Robert MacBryde (both graduated with awards and scholarships from the GSA at the end of William’s 1st year) and John Laurie, William also knew of Cowie. Thus Cowie knew William to be an experienced student who had already accomplished a great deal. In fact his talent for art had been recognised at an early age. 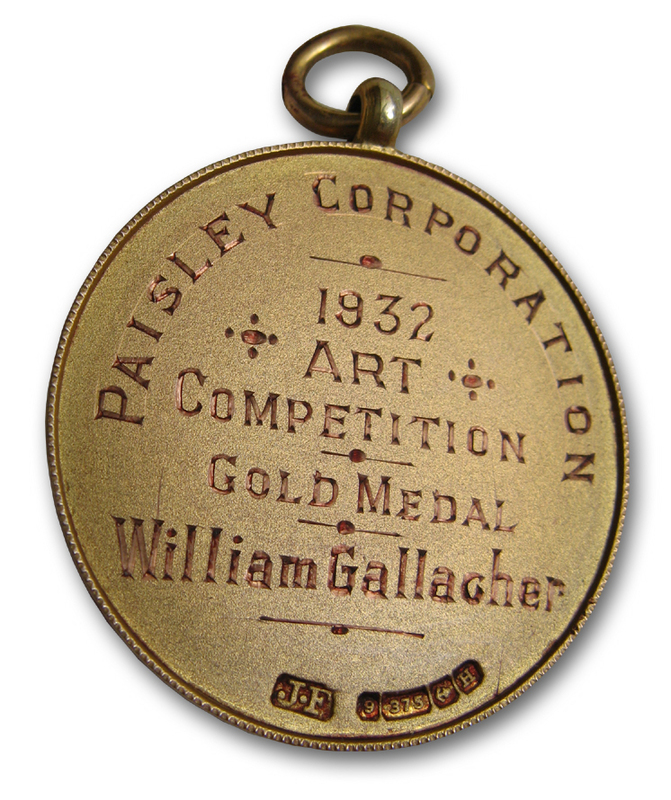 On reaching eleven in 1932, he was awarded the Gold Medal in Paisley Corporation’s school drawing competition. In 1934 he repeated his success, this time with Silver Medals for both drawing and his sketch book. The following year he won three prizes; Gold Medal for Drawing, Gold for Sketch book and Silver Medal for Design. The elected judges throughout these years in Paisley were the renowned artists W. Sommerville Shanks ARSA RSW and J.D. MacGregor RSW. In the same year William won a Silver Medal in the Glasgow Corporation Drawing Competition at Glasgow Art Galleries and Museum. The judging panel included the Director of Glasgow School of Art, W.O. Hutchinson, as well as George Houston RSA RSW and W.Sommerville Shanks. This was clearly a very productive year as he also won a ‘special’ prize for technical subjects at school. 1935 to 1936 was his last year at school since he was now age 15. His talent was recognised and he was offered an apprenticeship on leaving school to a firm painter and decorators; in these days this was often the first career step for an artistic young man. The above art competition judge J.D. MacGregor had started out along a similar pathway before he achieved a place at Glasgow School of Art and went on to work as a designer for Waring and Gillow. William, with the support of both his parents, worked hard to follow his passion for art and design. He achieved this by studying at Paisley Technical College and School of Art while undertaking his apprenticeship. Here he studied various drawing and painting skills and at the end of the year was awarded a Certificate of Merit of the First Class with a mark of 95% and was presented with First Prize of the year. By the end of this college year he continued working but now had enough finances, qualifications and a portfolio in place, to apply for a place at the GSA. He was accepted and began the new term in September 1937. He continued to achieve excellent results and was chosen along with a small group of first year pupils to work on a project at the 1938 Empire Exhibition in Glasgow with his Head of Department, Hugh Adam Crawford. 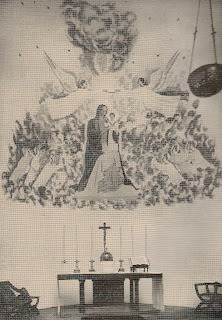 This involved of designing and painting murals on the outside walls and sanctuary wall of the Catholic Pavilion which was designed by Jack Coia. William had been a fellow student of Nita’s enrolling at the Glasgow School of Art the same year. They were friends through 1st to 4th year until he volunteered for the Royal Navy in May 1941. While Nita was nursing, William returned to the art school in spring 1946, in order to complete his diploma. In the spring of 1947 he graduated in style having been awarded the prestigious Guthrie Book Prize for best portrait study, a travel scholarship and a place at Hospitalfield. Here Nita and William had plenty of time to become reacquainted and spend spare hours socialising with Joan and Angus in the Hospitalfield park lands, beach and at Arbroath Harbour where they sketched and painted. Nita claimed to be lazy at Hospitalfield achieving but a thin portfolio. Whether this is exaggeration is not known, as very little of her work survives from this time. There is no doubt that she was still some way from the confidence levels of her peers. A shortage of work was not problem for William and Joan; more than a sufficient number of drawings and paintings were gathered together to create a joint exhibition of their work from their time at Hospitalfield. On return to the Glasgow School of Art, following selection by art school tutors, it was hung in the museum. Both Joan and William were then invited to study post graduate diploma during the session 1947 to 1948. Nita found it a continual challenge to reconcile the influence of Cowie on her work with that experienced at Glasgow School of Art. This led to her constant review and rework of her drawing and painting. A rare example of work executed by a Cowie student in the Hospitalfield studio is that of 'Still Life' by Nita (see below) and according to her there was a fair input by Cowie himself. It is reminiscent of the classic 'Cowie still life setting' with a small figurine juxtaposed with objects designed around it to give an exaggerated sense of scale. Seen clearly is a paint tube box, paint tube and screen which is created with a piece of folded paper; structurally simple with subtle subdued greys and small areas of strong primary colour and green. 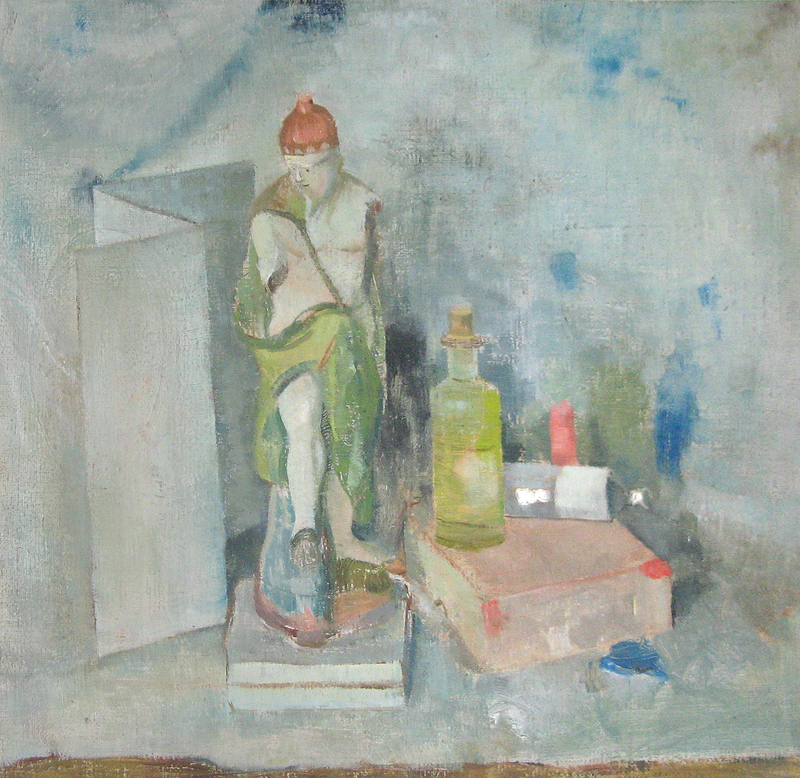 The figurine is likely to be that painted by Cowie in ‘Composition’ (see bottom left of painting), which can be viewed in National Galleries of Scotland’s ‘Modern Two’ building. While studying under Cowie, William had ample opportunity to refine his drawing skills; young local women were employed as sitters for portraiture and figure drawing and painting. And although there is no known work of William’s from this time, an example from another student. ‘Portrait of James Cowie’ by John Laurie* was painted that same year, 1947. 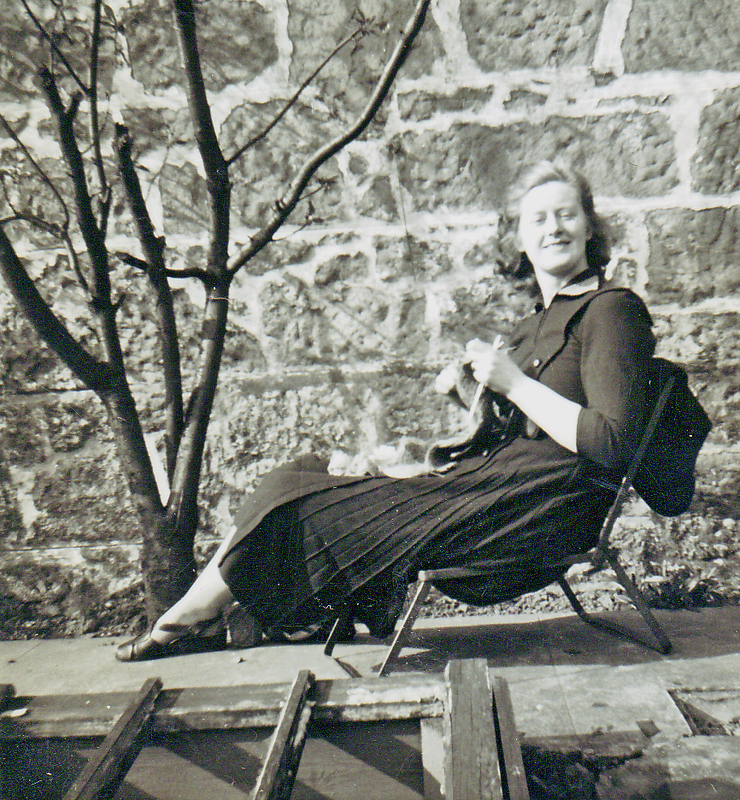 Laurie was one of Cowie's earliest students at Hospitalfield in 1938 and must have returned to Hospitalfield probably on more than on summer to work with Cowie. Laurie’s painting has two of Cowie’s reproduced in its background and it illustrates Cowie’s own technique of ‘picture within a picture’. It shows students working on a portrait of a local schoolgirl model. Exhibited in the RSA June 1947, I believe it is now in the collection of the SNPG and can be seen in Richard Calvocoressi’s book, ‘James Cowie’ page 62. William was not to follow this style but concentrated his focus directly on the sitter. *Laurie became a good friend of William Gallacher, both teaching at the GSA. Eventually he was to die at a relatively early age, I believe of food poisoning. Joan Eardley continued to paint during the years between leaving art school with Nita in 1943 and Hospitalfield in 1947 showing work with the SSA in 1942. 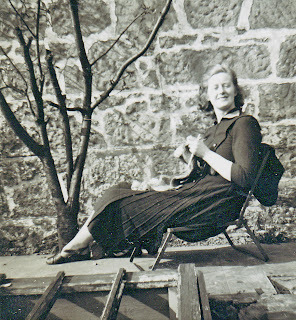 In the October after leaving art school she briefly studied at Jordanhill Teacher Training College but left and took up a position as a joiner’s labourer with a boat-builder. Here she was able to use her skills to paint camouflage designs on war landing craft. Some of this time she spent painting in Arran with Margot Sandeman, her friend and fellow student, and occasionally painted there alone. 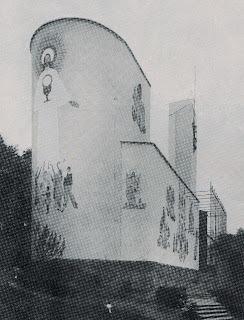 In 1946 she was commissioned to paint a school mural in Lincoln. By winter 1946/47 she was enjoying drawing and painting in London but she missed home in Bearsden and was frustrated at her painting progress. At this point she decided to apply for a place at Hospitalfield. Joan was also troubled by the force of Cowie’s artistic dogma and like many young sensitive artists found it challenging to assert her own opinions. She did however believe that Cowie and Hospitalfield presented a valuable experience not to be missed. One of her coping mechanisms was to make herself scare by disappearing of to the grain loft or to Arbroath Harbour to work; also she wrote to her mother to share her thoughts. Cordelia Oliver, William Buchanan and Fiona Pearson with Sara Stevenson have all written biographies of Joan. Like Nita there is no known work of Angus’ from this time, however, there is no doubt that he took it seriously since he made the decision to continue studying. Time spent in pursuit of art at Hospitalfield enriched the friendship between Joan and Angus; he must have been inspired by her success as an exhibiting artist and her constant commitment to her work while she saw both talent and vulnerability in him. In 1948, while Joan and William had been offered a year of Postgraduate study at GSA, Angus returned to Hospitalfield under the tutelage of the notable artist and engraver Ian Fleming of the GSA. Like the majority of synesthetes Nita was completely unaware that her abilities were scientifically described and she merely took them for granted. Scientists have known about synesthesia since 1880 when Francis Galton, a cousin of Charles Darwin, published a paper relating to this unusual condition in the journal 'Nature'. In more recent times many scientists have taken up this area of research once again as neurological research is more widely undertaken. It was, when in her early eighties, discovered she has an ability called synesthesia , a condition which she herself was well aware she had in which people's senses intertwine. There are numerous types of synaesthesia which can involve all senses - vision, hearing, touch, taste and smell. Some synaesthetes experience colours when they hear, read or even think of letters and numbers. For others, words can trigger a real sensation of taste on their tongue. Nita has the most common form which is lexical to colour synesthesia. Examples of her manifestation of synesthesia in numbers, days of the week and months show both texture and colour, for example, number 3 as a white-grey texture of towelling,number 4 as smoothish green, Tuesday is darker green and rough like boucle, while August is rough red. It is thought by scientists that insights into the neurological basis of synesthesia could help explain some of the creativity of painters, poets and novelists. According to one study, the condition is seven times as common in creative people as in the general population. Well known artists with synesthesia include David Hockney who perceives music as colour, shape, and configuration, and who has used these perceptions when painting opera stage sets but not while creating his other artworks. Also Russian painter Wassily Kandinsky whose sound to colour synesthesia combined four senses: colour, hearing, touch, and smell.